Frank Vignola, born December 30th, 1965, is one of the most extraordinary guitarists performing before the public today. 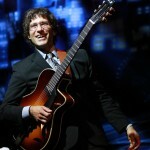 His stunning virtuosity has made him the guitarist of choice for many of the world’s top musicians, including Ringo Starr, Madonna, Donald Fagen, Wynton Marsalis, Tommy Emmanuel, the Boston Pops, the New York Pops, and guitar legend Les Paul, who named Vignole to his “Five Most Admired Guitarists List: for the Wall Street Journal. Vignola’s jaw- dropping technique explains why the new York Times deemed him “one of the brightest stars of the guitar”. With over 1000 engagements in the last five years alone, Frank Vignola has become one of the most popular and sought after guitarists on the international music scene. His dynamic genre-spanning music has brought him to 14 countries on three continents – and still growing – performing in some of the world’s most illustrious venues, including the Sydney Opera House in Australia, Carnegie Hall, The Palace of Fine Arts in San Francisco, New York’s Lincoln Center and the world’s oldest indoor concert hall, Teatro Olimpico in Vicenza, Italy. 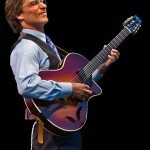 Often featured on National Public Radio, Frank Vignola has also become a familiar figure on Public Television, featured previously on three popular shows, including the heavily programmed Tommy Emmanuel and Friends. His own PBS special, “Four Generations of Guitar” produced by Peter Berkow, premieres in the 2015 season as part of the forthcoming 13 episode series “Music Gone Public”, where they will be joined by special guests, Bucky Pizzarelli, Joe Craven and Tommy Emmanuel. Vignola has written over 18 music books for Mel Bay Publications. He has also produced 8 full length video teaching courses for Truefire.com. His on-line lesson and workshop courses have had over 137 enrolled students in the last 2 years. He has and continues to conduct clinic’s, masterclasses and workshops at Music Universities all over the world including Julliard and Boston University.